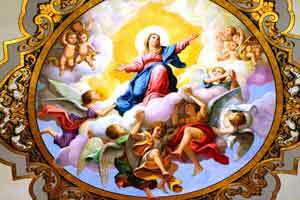 In Spain the Assumption of Mary celebrates the presumed day when Mary rose to heaven. It is annually celebrated on August 15th. This holiday is one that not all people get off and mainly Catholics celebrate it. Most have a feast on Virgin Mary's honor and go to a church service.